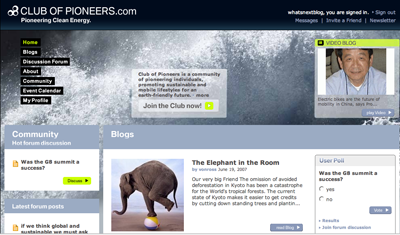 BMW’s Club of Pioneers, aims to gather individuals and institutions who care about creating an earth-friendly future. But the site’s been around for since 2006, and it still doesn’t convince me that that BMW actually gives a crap about clean energy. On the one hand, sustainability is the crucial issue of our times. On the other hand, BMW is a car company, and every one of them acts as if the energy crisis is something they just heard about last week. BMW could be a shining example if it did more than talk. BMW says on the site “We want to be part of this debate; together, we want to be a strong voice in that debate!” And a Club of Pioneers Award will be given in 2007 in the fields of science, lifestyle and media. In other words, BMW is not going to put any big bucks into a sustainable energy project, by funding research, development, manufacturing or anything else. They’ll just hand out awards and say nice things about clean energy. C’mon BMW, you can do better! Dear BMW – Why not celebrate, reward, and fund the best sustainable energy projects suggested and selected by members of the Club of Pioneers community? It is a sort of social networking site where you see profiles of all the members, some of whom have eco-blogs, and you can participate in discussion forums. Contribute often enough and they let you have your own blog on the site. My friend Piers Fawkes of PSFK is one of the bloggers, (although he hasn’t updated is Club of Pioneers blog since 2006) and so is Nick Aster of Treehugger, (who hasn’t updated his CoP blog since January 2007.) Other members do blog more regularly, but it’s still all just talk. Too bad BMW is not adding anything but bluster. Show us the money! When BMW starts making and selling bicycles, then I’ll listen to what they have to say on an earth-friendly future. In the meantime, I’ll stick to getting around on my two-wheelers. They’re much less expensive to own and operate than a BMW. Funny, BMW already sell their own bycicles.